The United States is little known for its cheese production and supply by chefs and culinary professionals but with China’s growing appetite for cheese and the help of premium food trade shows like World of Food Beijing (Nov. 18-20), the U.S. Dairy Export Council (USDEC) saw a perfect opportunity to gather representatives from China’s bourgeoning foodservice sector to showcase the expansive cheese selection from the United States. The November 17 educational seminar, brought together U.S. cheese suppliers with over 70 Chinese chefs, importers, and restauranteurs to learn about the premium quality of U.S. cheeses and the many ingenious ways it can be used in both Western and local dishes. U.S. cheese advocate Mark Todd led a cheese tasting and educated the audience about current American and global cheese trends in the foodservice industry such as the rise of fast casual restaurants and the increased prevalence of natural cheeses. U.S. suppliers who were present shared their own company story and product portfolios. With over 60% of China’s increase in cheese consumption led by western restaurants and pizza chains, cheese will continue to have a significant place in the Chinese market and U.S. suppliers are committed to foodservice customers who are looking to innovate with new cheeses and new applications. 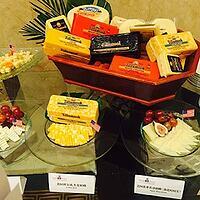 To find a U.S. dairy supplier, please visit our U.S. Dairy Supplier Directory and feel free to contact USDEC’s local representative with any questions.